From left: Wardo Ahmed, Saida Mohamed, Ashley Mitchell, Matthew Burgstahler, Diana DuBois, Coach Ahmed, Nicholas Rogers, and Abdi Kahin. 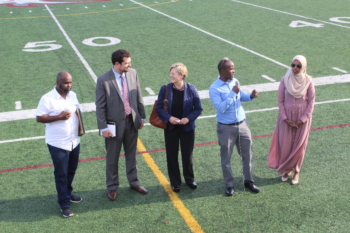 The campus of Augsburg College was bustling this past Friday evening, July 8th, as the annual Somali American Festival Week soccer tournament got underway. The West Bank Athletic Club hosts this incredible 9-day soccer tournament (July 8th-July 16th), which brings excitement and a surge of Somali culture and pride in conjunction with other festivities throughout the Metro area. This year the event follows the holy month of Ramadan and features both competitive live soccer and a celebratory atmosphere. This international tournament features teams from across Minnesota, the U.S., and Canada! WellShare International was one of 12 sponsors supporting this event alongside Medica, Minnesota United FC, Minneapolis Public Schools, VEAW, RPTA, People’s Center health services, among others. 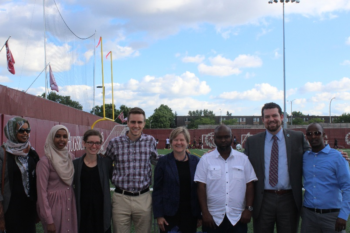 WellShare’s Executive Director, Diana DuBois, Program Manager, Ashley Mitchell, Program Assistant, Abdillahi ‘Abdi’ Kahin, Community Health Workers Saida Mohamed and Wardo Ahmed, and Summer Intern, Matthew Burgstahler attended the opening ceremony. Diana, Saida, and Abdi were called out onto the turf at 6:15pm with the Event Coordinator from the West Bank Athletic Club, Coach Ahmed Ismail, and Minnesota United Football Club’s President, Nicholas Rogers, in front of a sizable crowd for a brief presentation during the opening ceremony. Diana expressed WellShare’s gratitude and appreciation for the event and gave a few eloquent words about WellShare’s capacity in the Metro area working alongside the Somali community. She referenced the 15 different health programs WellShare offers and has previously engaged in since 2000. Diana concluded with the remark, “We are very happy to be a sponsor today because one of the big things we do is work with the youth”. She then passed the microphone to Abdillahi who discussed WellShare’s specific health programming, by starting with, “I speak Somali and English, but sadly I left my English at home today…” Abdillahi spoke for a few minutes about WellShare in Somali with an animated and impassioned tone. The atmosphere at the event was wonderful, if perhaps a bit tense due to the anticipation of great soccer. WellShare had a table set up during the event on the west side of the soccer complex next to the Kennedy Center 715 23rd Ave. S. Minneapolis, 55454. WellShare tabled throughout the week from 4pm-9pm and continued to spread information about their various programs. The event was sponsored by two of WellShare’s Programs specifically: (1) The East African Smoke-Free Program, and (2) The Somali Child Spacing Program. 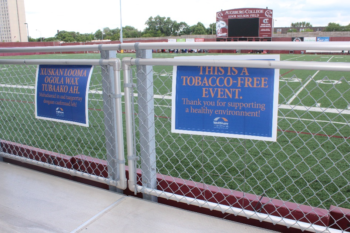 We are proud that the event is officially smoke-free and committed to engaging the community in their health. The final Championship game will be played on Saturday, July 16th, at 6:30pm. Subsequently, there will be a closing ceremony celebration featuring live music and tournament awards! Please come by, watch great soccer, and enjoy the fun. Happy Somali American Festival Week!